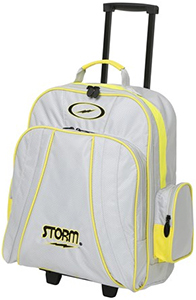 The Storm Rascal 1 Ball Roller is an ideal bag for transporting a single bowling ball, accessories and a pair of shoes without the strain on your shoulder or arm. This rolling bag has easy to open compartments due to its large oval bolt zippers and is durable due to its reinforced stitching. The foam base provides support and cushion that will hold protect your bowling ball. Dimensions: W 17" X D 10" X H 20"